As I mentioned in my post: The Art of Procrastination: My Writer’s block – Part Two, I love to bake and recently created Lemon Delight off the back of a mix of other recipes and the fact I had 8 rind-less lemons from making Limoncello. This cake is super lemony, if you want it less lemony, use less lemons, but personally I think part of its charm is the moist lemony-ness. Yes, that’s a word – when it comes to baking, all coined words becomes actual words. I’m sure more will appear as we go along. 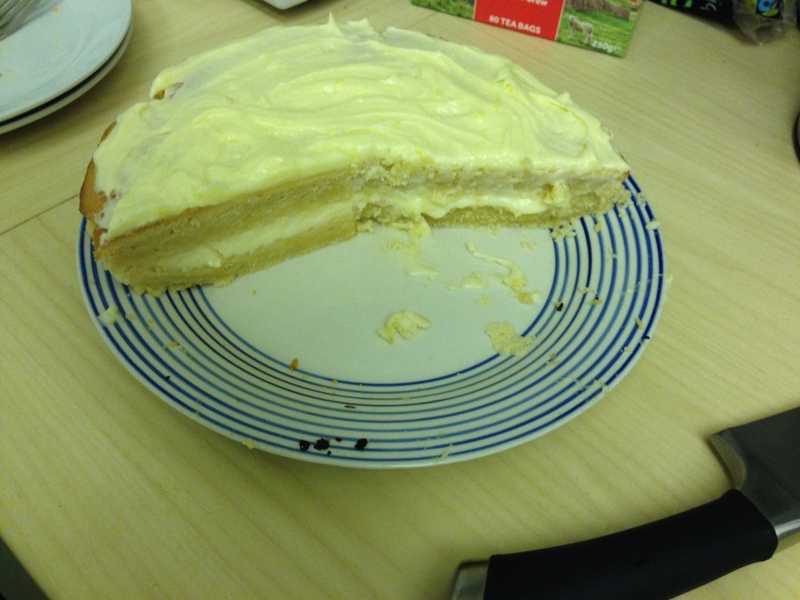 I’m afraid I only have ‘after’ images as I hadn’t actually planned to blog on it, but the cake was too awesome not to. So there are no handy ‘going along’ pictures, I’ll do my best with words. Right, let’s get stuck in shall we? I found the method from the original recipe a bit crappy seeing as I had lumps in my mixture so I’m going to offer a technique used in other recipes. If you have two cake trays of equal size this should be a doddle, if not (like myself), the two layers will need to be done one at a time. To ensure they are of equal size, I split the ingredients in half and whipped up one batch, put it in the oven, while that was cooking, I whipped up the second batch. Feel free to tackle this dilemma as you wish. Make sure your butter is room temp, if it’s refrigerated, you will have a tough time with the icing and lumpy cake mixture. In a bowl, give your butter a bit of stir so it’s more creamed than lumpy, then add your sugar. Cream this together- either with a spoon or a mixer, although there may be too few ingredients for the mixer at this point and you’ll end up with a buttery sugar mess on the whippy mixer parts. Add your eggs and mix. Add your flour and baking powder- this time go nuts with the mixer- a nice fluffy consistency would be great. Now, I had rind-less lemons left over from Limoncello, so I squeezed 3 lemons into each half, so if you’re doing the full mixture that’s 6 lemons juiced. I would recommend juicing in a separate bowl first, or your cake will be full of pips. It may seem obvious, but there I was picking lemon pips out my cake mixture. I did also grate a bit lemon rind in with the juice, but I’d say don’t put more than half of a lemon’s rind in or it will be too lemony. When you’re all mixed up, lump free, and seems quite fluffy, line the tray with baking paper and pour the mixture in. If you have two trays, carefully split the mixture between the two, making them as even as possible. If you’ve split the ingredients into two, repeat the above steps while the first cake is cooking. My initial instructions stated 25 minutes- this isn’t long enough. I have a gas oven and it needed at least 40 minutes. I’d recommend checking the cake at 30minutes, stick a knife in, if it’s clean you’re probably ok, if it hasn’t ‘goldened’, you might want to put it in for a tad longer. Do this with both cakes, whether at the same time, or one at a time, and then leave to cool. Now, ‘leaving to cool’ is essential, the filling will melt if the cakes are still too warm, as will the icing. I’ve made this mistake too many times because I’m inpatient. I’d recommend moving the cakes onto a plate or cooling rack if you have one. While the cakes are cooking or cooling you can whip up the filling. I creamed (stirred with a spoon) the mascarpone (make sure this is room temp or it’ll be tough), so that it wasn’t lumpy and added the icing sugar, mixing and creaming as I was going along. Once this has created a thickish mixture, add the cream (no lemons- this has to act as a lemon neutraliser). Mix in with the spoon and then get the mixer in for some whipping action. This will take it from a liquidy state to a fluffy filling style state. I was worried about over-whipping, so I didn’t go too nuts, but it’s your cake so make it as fluffy as you like, just don’t enter the butter realm :-p.
Once the cakes have sufficiently cooled, spread the filling over the cake you want as the base. Make sure the top is completely covered with filling. Carefully place the top layer of the cake on top of the filling. I used a double spatula combo for this, I’m sure there are better, less likely to crack and break everywhere techniques, again, up to you. Cream together the butter and icing sugar. Add half a lemon’s juice and a bit of lemon rind and mix in. Cover the top of your cake with the buttercream icing. Voila – you’re done. Exhausted yet? 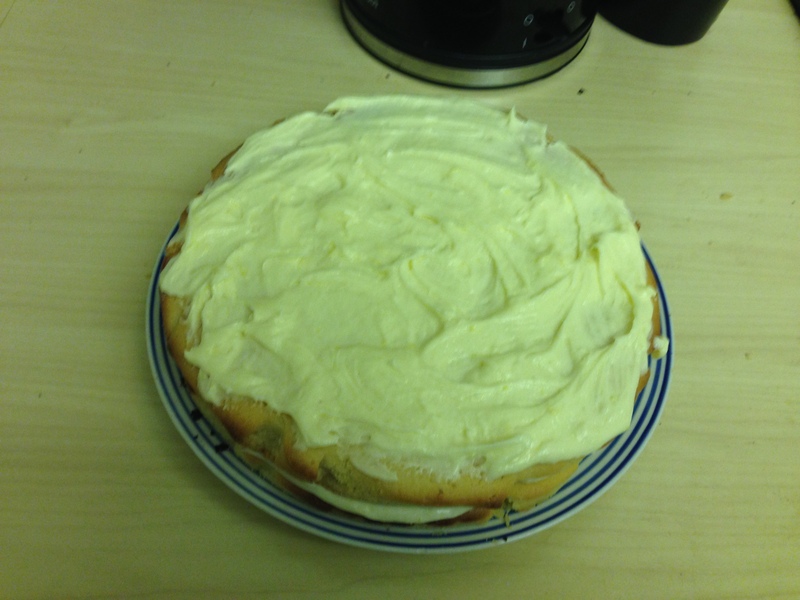 I was but the results were amazing (doesn’t look perfect but that’s a personal difficulty with presentation…): Lemon Delight.